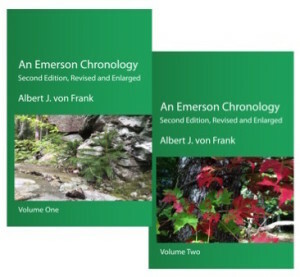 Announcing “An Emerson Chronology,” 2nd edition, revised and enlarged, by Albert J. von Frank. The long-awaited, thoroughly revised, much-expanded second edition of this indispensable reference work will be available in late May. The new edition of the chronology runs to more than 1100 pages and is being published as two reasonably-priced softcover volumes.